A Historical Tour of Walt Disney World Volume 1 by Andrew Kiste reviews the real world history behind key Walt Disney World attractions. 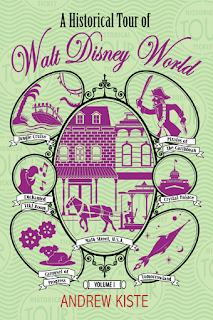 Kiste visits attractions in Main Street U.S.A., Adventureland and Tomorrowland in this volume. The author provides a brief overview of the land and then explores two to three attractions in more depth. A Historical Tour of Walt Disney World Volume 1 is a book for the history junkie! Do you want an extensive history of the Crystal Palace and its place in history? Would you be interested in architectural differences between the original Crystal Palace in London and the Walt Disney World version? Or would you like to know what happened to the original building in London and if it is still standing? If so, this book is one that you would enjoy. Do you watch a movie like Braveheart and then start to breakdown the differences between the real historical events and the movie? If so you might enjoy Kiste’s breakdown of Pirate of the Caribbean and the actions pirates took in real life in comparison to what is seen in the ride. Do you want to know the chances that a pirate would have been surrounded by gold and silver in a treasure room? Then again this book is for you. Kiste’s writing is clear. But for some it may be too serious in tone at times. He has researched the real life non-Disney historical events and places very well. A good example is the Crystal Palace chapter which includes references to scholarly articles going beyond the typical Disney library. Do you love history? Are you the person in your circle that enjoys sharing what others would believe are obscure historical facts? If so A Historical Tour of Walt Disney World Volume 1 is probably the book for you. Now I’m sure I will never look at the Crystal Palace in the same way again!